Many people opt to travel in style when they take a break from their busy schedule. Sure, staying at a small family-owned resort does have its charm, but sometimes you want to enjoy better conditions and service. All-inclusive resorts cater to their guest’s every need and take all the worries off your mind. You can relax, clear your head and focus solely on enjoying your time away from work and everyday life. These types of resorts are especially good for families, as many of them offer a lot of in-house activities and attractions to keep your young ones occupied while you lounge by the pool or beach. The only problem is, they are usually quite expensive and are hard to find in certain locations. What few people realize is that you can actually book such an all-inclusive holiday in Cebu and Bohol, at only a small percentage of the price you’d pay in Boracay or Palawan’s private island resorts. The trick is knowing where to go and understand beforehand what you are going to receive at each property. Most of the hotels listed below offer full board and an open bar for local drinks only. Some also have tours and facilities the whole family can enjoy, although most tours will come at an extra cost. If you have any special requests, the best idea is to use the services of a local travel agent to help make your booking – these Philippines all inclusive packages are a good place to start. Mactan island is the best place to find these type of accommodation, especially if you are travelling with small children. The Shangri-La in Mactan is always a safe bet, but to be honest there are quite a few better options you can consider. This specific Shangri-La is the least impressive compared to the others spread over the country, and the price is almost as high as you’d pay in the most luxurious 5-star resorts in Boracay or Palawan. That said, if you don’t want to risk it and want to have a 100% guaranteed VIP experience, this is still the best place to stay. 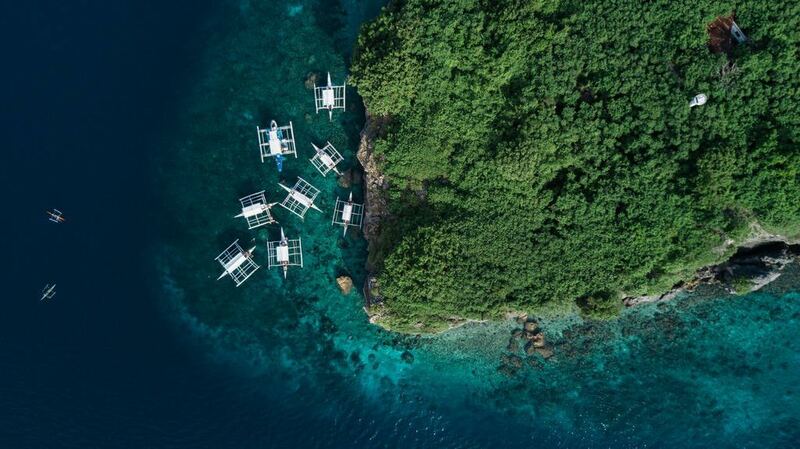 For a more private luxury experience, try out the Abaca boutique resort instead. It’s a small place with only 8 rooms on site, where you enjoy the ultimate VIP experience with a personal butler and full staff catering to your every need. Sadly, they don’t offer full board options, so you will have to pay for each item you take on the spot. However, the value of service and quality of product offered there is exceptional. If you want that big resort vibe but don’t want to spend a fortune on the Shang, then Crimson is an excellent alternative. For half the price you still enjoy the comforts of a 5 star resort, and they even offer a full board package deal. Look at their site for promos! If you want a pampering experience, it doesn’t necessarily mean you’ll have to be stuck in Mactan. There are luxury resorts sprinkled all across Cebu island, and even though they are admittedly not as fancy as the ones in Mactan, but they offer a completely different atmosphere. Moalboal is the place with the best attractions and overall surroundings, but there aren’t really all inclusive resorts there in the true sense of the word. Accommodation there is pretty basic, but you can find a couple of nice resorts in the White Beach area, and these also offer full board packages and organize all the tours for their guests. Oslob on the other hand is quite boring to stay at, but it is home to Soumilon island – one of the nicest private island resorts in Cebu. Malapacua is hard to reach and can be a bit boring if you don’t dive, but the resorts there are really good. It’s a perfect place for couples who want to stay away from civilization without dropping their standards too much. There are quite a few boutique resorts here offering excellent full board packages, as well as complimentary spa and other small perks such as yoga classes, beach activities and much more. Lastly there’s always the option of taking the short ferry to Bohol and just staying there. While you can easily just take a day tour of the island, there’s also a lot of merit to staying there for at least 2-3 nights instead. Alona beach in Panglao is the best area to stay at, and you can find a lot of different 4 and 5 stars resorts that offer a variety of additional services and amenities. The beach in Bohol is far superior to those in Cebu, and so is the nightlife in Panglao. Add to that the rich selection of outdoor activities and attractions, and you see why this might be smart choice. Out of the various resorts in Panglao, Amorita resort offers the most complete package. Keep an eye open and visit their website, and you can find various time limited offers and promos. It’s not only one of the best hotels on the island, but it’s also the best one when it comes to providing a true all inclusive stay. Photo credit for featured image goes to Ken Suarez on Unsplash.